I’m going to take a slightly different approach to my previous two examples and split the Producer and Consumer into two different Windows Forms. This will allow us to run as many Consumers as we like and so demonstrate Pub/Sub effectively. First up is the Producer. Create a new Form and add the Input TextBox and Button as in the first two examples. Also and a new Button “Start New Consumer” . In the previous two examples we had pretty much duplicate constructors for both Consumers and Producers. We will now fix this by creating a base class that these can both inherit from. Create a new class called IConnectToRabbitMQ. The class name may look a little odd to most as it begins with an “I”, this is usually the naming convention for an Interface but I’m using what I like to call Simon Says naming convention. I’ll be writing a post about this in the near future. The main gist of it, is I like to have classes tell me what they do. For example, a class which calls a remote service might inherit from a class(or interface) called ICallRemoteServices. So the full class name definition would be FooService : ICallRemoteServices. There would also be a abstract method defined that implements the action e.g CallRemoteService. Other example are IAmAnOrder(for a value object), ICalculateShipping, IDeliverEmail etc. This may seem a little weird but I like it :). So enough of that for now, lets go through the class. First we declare fields to hold the familiar IModel and Connection instances. Next up are fields to store the details of the Server, Exchange and ExchangeTypeName. Exchange is the name of the exchange we want to publish/consume messages from and ExchangeTypeName holds the type of exchange we want to use(in this example it will be “fanout”). ExchangeType is set from a constant declared in the RabbitMQ.Client.ExchangeType class, so for us it will be ExchangeType .Fanout(More on this later.) Next we have the ConnectToRabbitMQ() method, this is almost exactly the same as the Constructor methods of the Producer/Consumer methods in my previous two examples. We have this additional block which declares the Exchange. We are declaring a durable exchange of the type ExchangeTypeName with the name ExchangeName. If this exchange had already been declared by another Producer or Consumer a new one is not created, the existing one will be used. Now we’ll write our Producer. Here we a have a nice lightweight publisher, the only difference from our previous examples is we are publishing to a named exchange called ExchangeName. We do not know about or use a Queue. Then it’s our consumer, this is slightly more complicated. What we are doing here is asking the model to declare a temporary queue for us and give it a random unique name(stored in QueueName), we then bind this queue to the Exchange called ExchangeName. The Consume() method is very different to what we have seen before(and the Java Example). Instead of using a QueueingBasicConsumer we are using a Subscription. 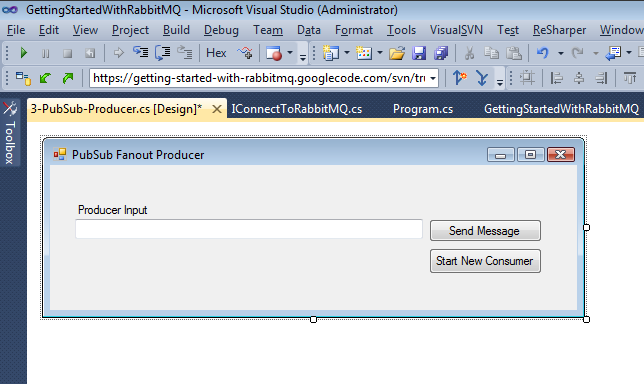 Subscription is part of the RabbitMQ.Client.MessagePatterns package in the .net client Library. It give us a nice wrapper to the boilerplate message de-queuing code. More info is here. This should be fairly self explanatory. 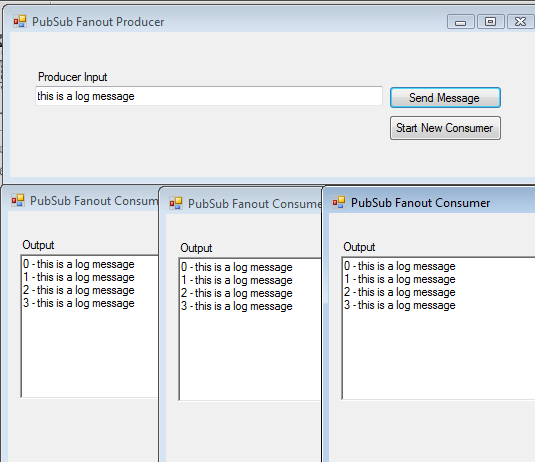 The producer.ConnectToRabbitMQ() call is handled in the base IConnectToRabbitMQ class. We’ve added little error handling code just in case the broker is unavailable(if it is run rabbitmq-server -detached from the command line .) There’s also a method to handle clicks on the “Start New Consumer” Button which spawns a new Consumer Form. Then we have our Consumer Form. This is exactly the same as previous Consumer examples with the additional call to the base class. ← Somebody is reading my Blog! Thanks for your blog. Very nice articles! Laval, Thanks! keep checking back I’ve got a lot more in the pipeline. Nice implementation! Forms are, as you mentioned in the first part, more familiar to .NET:ers than the command line. I can’t find the source for download under the provided link (“This project currently has no downloads.”). Thanks for pointing that out! I’ll upload some sort of archive for non-svn users after I’ve finished the next section. 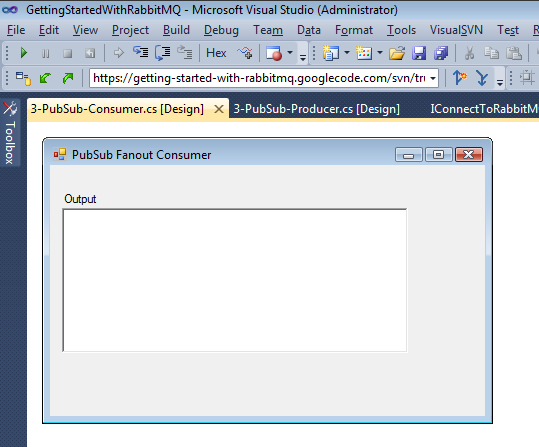 Awesome examples of RabbitMQ in .Net. Any plans on doing an RPC example? part 4.. i completed the example 4.. Thanks a lot for this blog. It’s really clear and helps a lot. Is anyone working on the fifth and the sixth part? I’m working on it and it takes me a lot of time to complete the whole code. Very good blog! Many Thanks! Hi, thanks for the post it is really useful, but i have question. What if rabbitMQ server is down and then back, how can i keep continue consuming. Because i lost connection. I’m unable to connect to my rabbitmq server.